The Hershey Company is a leading global manufacturer of chocolate and non-chocolate confections, gums, mints, and snacks. At Hershey, goodness extends beyond the delicious products they produce. 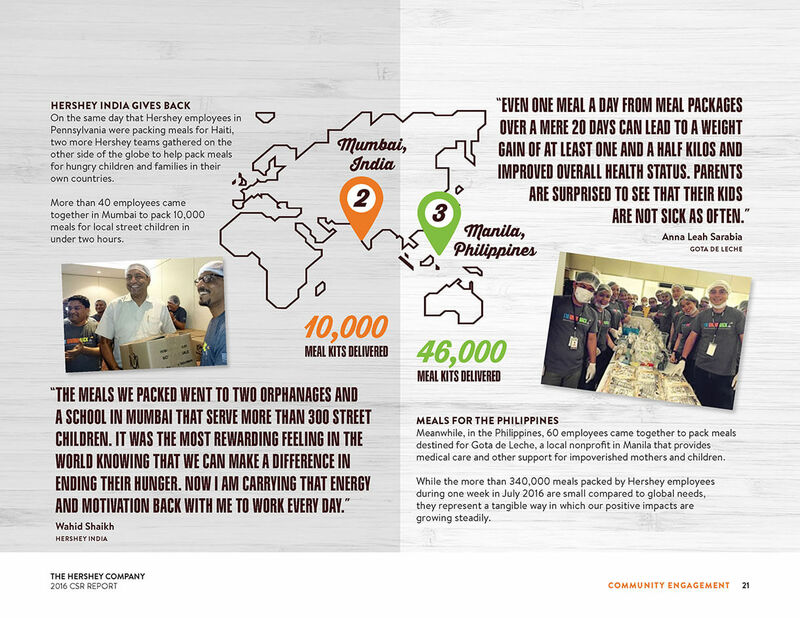 Shared Goodness is Hershey’s corporate responsibility ethos and it’s their way of doing business that benefits stakeholders at an individual, community, and global level. This deeply held belief guides their people and their growth. Hershey wanted their sustainability report to really communicate all the goodness Hershey brings to the world—which meant getting people to read, enjoy, and react to it. For that, they came to Duarte to get some help crafting a compelling narrative and a gorgeous visual story. Working with the Hershey team on something so core to their brand was a thrill—we partnered directly with the company’s chief creative officer, who provided us with a real understanding of the brand’s past and their future direction. We took the time to understand the various audiences who’d see this report—from the investors at the launch event, to watchdog groups, employees, and customers. We realized the narrative would drive the front of the report, gripping the audience—and that much of the important detail could go in the back, for people who wanted to know more. We created mood boards and key frames to show our thoughts on how their story could come to life. The end product was a visually stunning story of Shared Goodness, accompanying the data necessary to report on their commitment to sustainability. Hershey got great responses from their stakeholders and now they showcase the report online to share their story with many different audiences.